Considered the crown jewel of the $450 million Marriott Place, the JW Marriott Indianapolis Downtown is the largest JW Marriott in the United States. Their downtown hotel in Indianapolis soars above the city, offering unmatched views of downtown Indianapolis. The hotel features two superb restaurants, High Velocity and Osteria Pronto. Wanting to pick up their bottled water sales while at the same time “greening” the property, the JW Marriott switched to Vero Water, taking adavantage of Vero’s unique retail pricing structure and reducing the amount of waste created by their previous bottled water service. 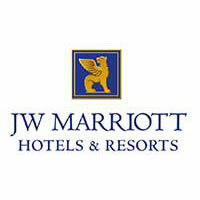 Of Note: The JW Marriott Indianapolis boasts one of the largest Marriott ballrooms in the world, offering more than 103,000 sq ft of meeting, banquet, and exhibit space as well as two full-service restaurants.